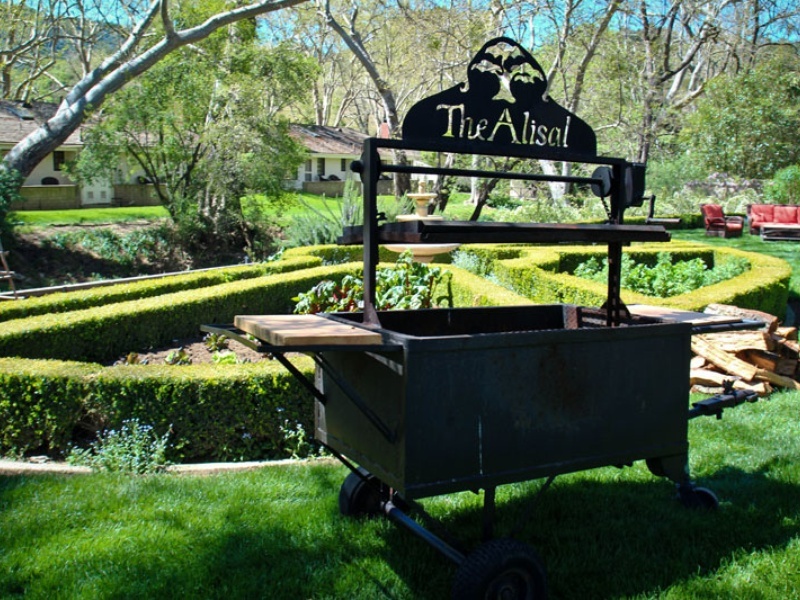 All photos courtesy of Alisal Ranch unless otherwise noted. Blame it on the family Winnebago tours of the southwest, vacations watching killer whales breaching off the Alaskan coast, or her husband's proposal on a hilltop in Rioja, but all those days away from home fuel Schuyler Bailey's constant urge to explore. 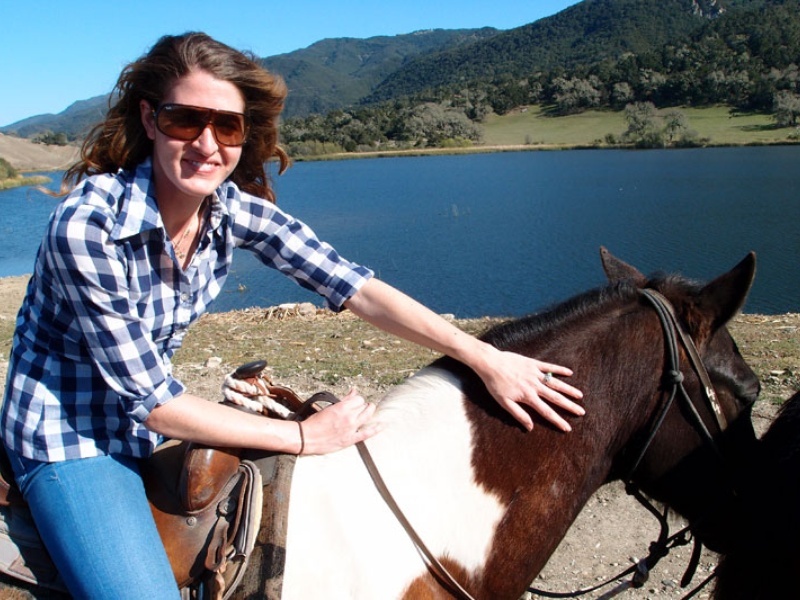 The San Francisco-based editor and writer spent a few days in Central California this spring. SOLVANG, California – Some people travel for the sites, others for spiritual awakening. This time, I traveled in search of the answer to the age-old question: Where’s the beef? Apparently, it's at , where a BBQ Bootcamp is three days of meat, fire, and cowboys of both the real and wannabe variety. We arise in our courtyard studio to birds chirping and the faint smell of burnt oak from the in-room fireplace. After arriving the night prior to a welcome barbeque buffet (complete with award-winning drafts by local outfit ), we quickly conked out, so we were eager to see our surroundings in daylight. Imagine Dirty Dancing's Kellerman Resort plopped on 10,000 acres of central California cow country: endless trails, bucolic rolling hills, hundreds of horses, and old-school accommodations brimming with rustic charm. A light breakfast later, we head to Creekside Lawn for our first lesson with Alisal's executive chef Pascal Godé and The Hitching Post II's (of Sideways fame) chef/owner Frank Ostini. The comedic pair banter as they demo fire building and show off grilling skills on two massive Santa Maria-style specimens. Key takeaways (invest in oak, seasoning is your friend, always undercook) leave us confident; their tutorial bounty (lunch of tri-tip, tuna salad, fresh fruit) spoils us. Hunger has no place here. While other guests retreat to the pool or spa, we saddle up for an afternoon ride around the lake. Our guide points out a bald eagle in its nest and Reagan's neighboring ranch while we revel in our picturesque trip. At sunset, Ostini's partner Gray Hartley greets us with wines. Godé and Ostini man the grills. Between sips of complex pinot noirs, we pick bacon-wrapped scallops, Thai shrimp, and spicy kielbasa straight off the grill. More feasting follows, and we're in bed before 9 p.m.
We wake at sunrise for the highly anticipated breakfast ride. The horse-adverse take the hay wagon, while the rest of us hightail it for Old Adobe, a historic camp nestled among a grove of sycamore trees. Picnic tables filled with families, an old cowboy strumming a guitar, and a stick-to-your-ribs Western breakfast await our arrival. 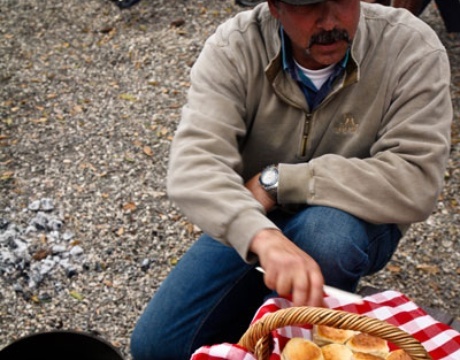 The bootcampers crowd around a fire pit, where wranglers line a Dutch oven with concentric circles of pillowy dough. These sticky little handfuls are the biscuits we've been whispering about, and we study as they close the lid and cover it with red-hot coals. Our patience is tested as sweetness wafts our way, and they finally unveil the golden brown bundles. We butter and devour. The ride back is slightly less pleasant with bellies full of biscuits, but we're pleased nonetheless. There's really no reason to leave the ranch, but we grab our boxed lunches and amuse ourselves with a visit to nearby Solvang, which is like driving five minutes to Denmark only to be bombarded by tourists and disorienting architecture. Again, there's really no reason to leave the ranch. We return for the spice-blending seminar. Two rows of eighteen ingredients with spoons at the ready line a banquet table. Following brief instruction in flavor profiles and matching proteins, we grab our mixing bowls and have at it. My husband and I take turns accosting Godé for advice on seasoning fish (me) and chicken (him) before concocting our own blends: Something Smells Fishy Powder with star anise, celery salt, lemon pepper, and ginger powder; Chicken 3/10/12 with sea salt, chipotle pepper, oregano, garlic, and paprika. Tonight, we test. First, an education: wines in-hand, we form a circle around ’s Robert Esser. The man is meat obsessed, and he guides us through cuts, identifying quality versus marketing, and what to ask the butcher. Inspired, we venture to the protein platter to pick out our entrees. Under our grillmasters watch, we take our tri-tip, flank steak, chicken breasts, shrimp, and salmon (the most beautiful I’ve ever seen) to put our lessons to practice. 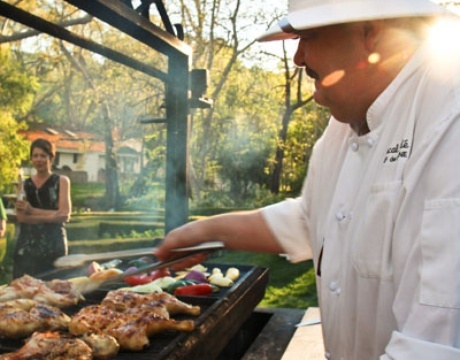 We find the good spots on the grill (hot, but not too hot) and let the oaky smoke infuse its magic. There's something about cooking with fire that makes everything taste exceptionally better. We retire to the Oak Room for a nightcap and are fast asleep in our room by 11 p.m. I discover the ranch's granola at breakfast – packed with cranberries, raisins, walnuts, and cinnamon – and wonder where it's been all my life. We bid adieu to our cooking compatriots and hit the road. En route north on 101, we drop into Costco to survey the selection of Santa Maria barbecues. I guess we weren't quite ready to leave. Fly to Santa Barbara Airport (SBA). 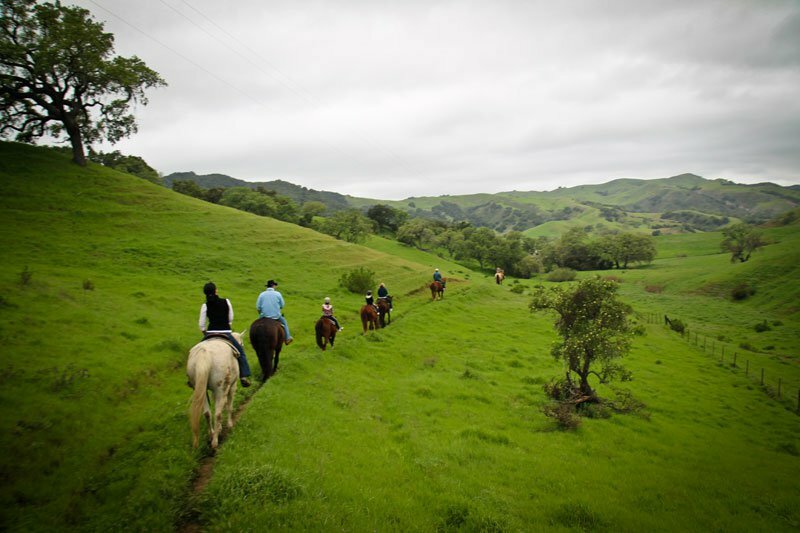 The is ranch is about 35 minutes northwest, just outside Solvang. If you’re flying private, you’re welcome to land at nearby Santa Ynez Airport. Located midway between San Francisco and San Diego, and approximately a three-hour drive from Los Angeles, you can easily get there by car on scenic Highway 101. Conneticut bred but California braised, DailyCandy San Francisco editor Schuyler Bailey lives to hit the road (or plane, train, catamaran, rickshaw, what have you). She travels for the perspective.